Having served for almost three decades, India’s fastest Delhi-Bhopal Shatabdi Express will be replaced by yet another Shatabdi train type. 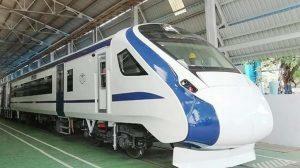 Indian Railways has rolled out its first 160 kmph capable self-propelled train set named Train 18 aka Vande Bharat Express. Designed in just 18 months, the engine-less train set will be replacing the aforementioned train soon. Manufactured at ICF Chennai at a cost of Rs. 100 crore, the train consists of 16 fully-AC coaches and flaunts the ‘Make in India’ tag. Here are some of the interesting facts about Train 18 now Vande Bharat Express that will compel you to embark on this engine-less wonder soon. Exteriors – The color scheme of white and bullet has been taken by ICF – a first for Indian Railways. This is done to get the look and feel of the world-class bullet train. Cabins – There is an aerodynamic driver cabin at each end of Train 18. According to Sudhanshu Mani, ICF GM, the numerous equipment of Train 18 communicate with each other digitally. Also, the entire set works as a computer unit. Seats – Two Executive Chair cars come equipped with comfortable European-style seats adorned with golden-colored fabric. Pink and purple headrest remarkably compliment the fabric which is fire and dust resistant. The executive chair car seats have a distinctive feature that they can be rotated 360-degrees to face fellow passengers. Doors – To bridge the gap between the train and platform, Train 18 features centrally operated automatic doors with sliding footsteps. The entry area of the coach is equipped with automatic sliding doors with optical sensors. Lighting – Diffused LED lighting in the train is inspired from the ones in the aircraft and can be dimmed or brightened depending upon the time of the day. Personalized reading lights are available at every seat. Toilets – Bio-vacuum toilets mirror that of an aircraft and are employed for efficient flushing. Optimal consumption of water has been tried to achieve by the use of touch-free sensor-based fittings. Mini – pantry – Each coach has a mini pantry with world-class imported equipment for better chilling of juices and cold drinks and heating of food. Configuration – Usual 3+2 configuration has been used to employ seats in the non-executive chair car. The European-style seats feature leather-like covering with the graded coloring of pink and purple. Foldable snack tables are now attached to the middle table area of the coach. This bridges the gap between the table and the seat to make it easy to eat the food. Ease of movement –Also for the first time, the train comprises of fully sealed gangways to offer easy movement between the coaches. The more-effective air-conditioning keeps the coaches dust free. Easy movements of the passengers within the coaches has been facilitated by providing handles next to the headrest in the aisle seats. Special features – Not everything in Train 18 imitates the features of an aircraft. Rather than pushing the back support of the reclining system, passengers traveling in Train 18 has to push forward the seat below. This creates the reclining posture and also doesn’t reduces the space of the passenger sitting right behind you. A button is available to do the same in the executive chair cars. The information about the time of arrival, the next destination and the speed will be displayed on the two GPS-enabled information screens at each end of the coach. Train 18 has toilet occupancy indicators and spacious cushioned luggage racks. Use of regenerative braking makes it more energy efficient train. There will be no diesel-based locomotives or power cars and hence the carbon footprint will reduce significantly. Window – Continuous windows in Train 18 offer a panoramic view of the outside world. Touch-based push up/down blinds on the windows add to their charm. Internet – Passengers can avail the onboard Wi-Fi facility to watch pre-loaded content on their personal gadgets. There are device and mobile charging points adjacent to each seat. Space – Other equipment and the propulsion system are under-slung leaving the entire space on board for passengers. The driver cab coach comes with passengers seats with no locomotives needed to haul it. Disabled- friendly – The engine-less train caters to all the needs of the specially-abled people and makes their journey comfortable. Space is reserved in the trailing coach adjacent to the driver cabin to park the wheelchairs whereas the driver cabin allows wheelchairs to be rolled in from each end of the train. Reduction in travel time –The rigid couplings and propulsion system in the bogie offers jerk free rides with faster deceleration and acceleration. This in return reduces the overall travel time by 15%. With so many exciting features to benefit from, the Indian Railway passengers can expect of a memorable sojourn in Train 18. What is the difference between Palace on Wheels and Maharajas Express?